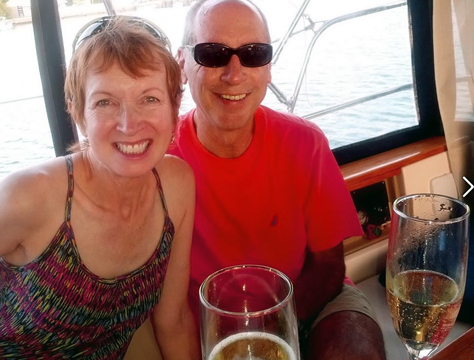 At 8 AM on Saturday, May 16th, we bid a fond farewell to friends Sharon and Greg of s/v Dream Catcher and depart Charleston Maritime Center at high tide, riding the ebb at 7 knots through the channel, past the breakwater and into the open Atlantic Ocean. Our destination is Beaufort, NC, about 200 nautical miles to the northeast. The weather could not be better for our passage. Under sunny skies, seas are 2 to 3 feet and winds are from the south at 10 to 12 knots. Cutter Loose is motorsailing along nicely at 6 knots in these benign conditions. 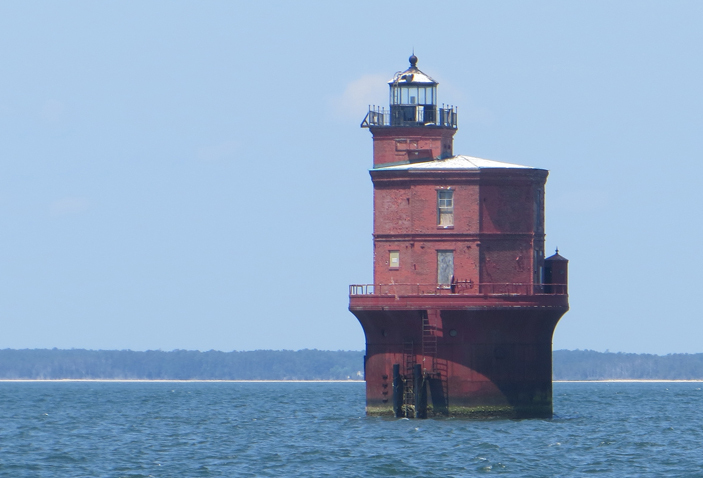 The first 132 nautical miles of this journey involves steering a course to the east of Frying Pan Shoal, a shallow bank that protrudes some 18 miles into the Atlantic Ocean from the mouth of the Cape Fear River. At 4 AM on Sunday morning, Cutter Loose arrives at our waypoint on the seaward side of the shoal where we set a new course towards Beaufort inlet, another 80 nautical miles to the northeast. Since midnight, we have been closely monitoring the radar screen in an effort to track the movements of a nearby sailing vessel on a parallel course to Cutter Loose. From AIS information, we discern that she is the same vessel that docked next to us at the Charleston Maritime Center. This morning her range has been roughly a quarter mile away, which is uncomfortably close, especially for night sailing. After all, the Atlantic is a huge ocean. There is no apparent reason to sail in such close proximity to another vessel. At 0430, the intruder has increased speed and is overtaking Cutter Loose on her starboard side. Inching ever closer, she appears to be angling towards our bow. Our anxiety level increases as efforts to communicate with this vessel via VHF radio go unanswered. Gradually, she overtakes Cutter Loose at close range. She is now one boat length in front of our bow. After repeated efforts to hail the vessel on VHF, the Captain finally responds. He seems disoriented at first… unaware of our position. After several minutes of silence, the captain states defensively that he cleared our bow with sufficient separation. We can only assume that the person on watch was either asleep or not paying attention. A close call such as this in the middle of the night is unnerving to say the least. At sunrise, the engine begins to behave strangely, surging in an uneven tempo. There is a noticeable loss of power. At 2200 RPM, white smoke appears from the exhaust. The engine is apparently being starved for fuel. Changing the fuel filter while underway seems to improve performance, but the cure is short-lived. We limp towards Beaufort under reduced power, hoping that the engine will not fail. At 5 PM, Cutter Loose finally arrives at the Beaufort sea buoy. Dodging the massive dredging equipment in the channel, we make our way slowly towards the 8 PM and final opening of the downtown highway bridge. Now beyond the bridge with only minutes of precious daylight remaining, we discover that the Town Creek anchorage has been eliminated by construction activities. It appears that a new bridge is being constructed to replace the highway bascule bridge that we just transited. In darkness at 8:30 PM, the anchor is down along the narrow edge of Gallant Channel. 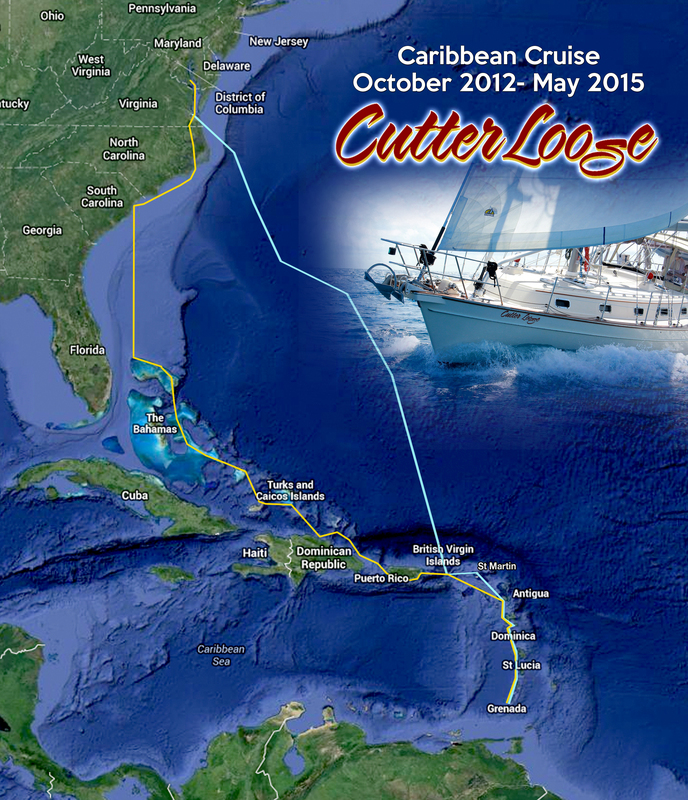 In the past 36 hours, 221 nautical miles have passed beneath the keel of Cutter Loose since departing Charleston. Thankfully, the engine has delivered us safely to this place of rest. On Monday 5/18, our priority is to secure the services of a diesel mechanic to diagnose and repair our underperforming engine. Since Town Creek Marina is a Yanmar dealer and is located nearby, it makes sense to schedule an appointment at this establishment. However, Town Creek Marina is closed on Mondays, which prompts a conversation with Deaton Yacht Services in Oriental, NC. The anchor is up at 10:40 AM for the 20-mile run to the Deaton Yard on Whitaker Creek where a slip on the face dock awaits our arrival. 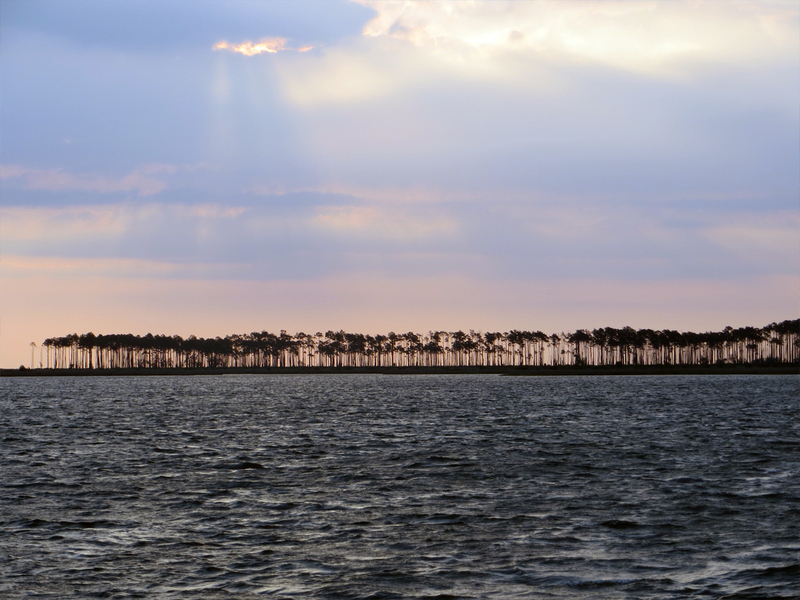 The Atlantic Intracoastal Waterway from Beaufort to Oriental follows Adams Creek, a dredged canal dotted with forests and homes. It is a gorgeously sunny day on the ICW. The trees are green with new leaves. Birds are conversing near the shoreline. The sweet aroma of jasmine fills the air. Although it is quite different from the Caribbean and the Bahamas, this setting is quite attractive in its own way. The water, however, is a stark departure from the crystal clear waters of the Bahamas. It is dark and murky, painting a brown moustache on the hull of Cutter Loose. To our surprise and delight, the engine is running smoothly today. Yesterday’s surging and power loss are a thing of the past. 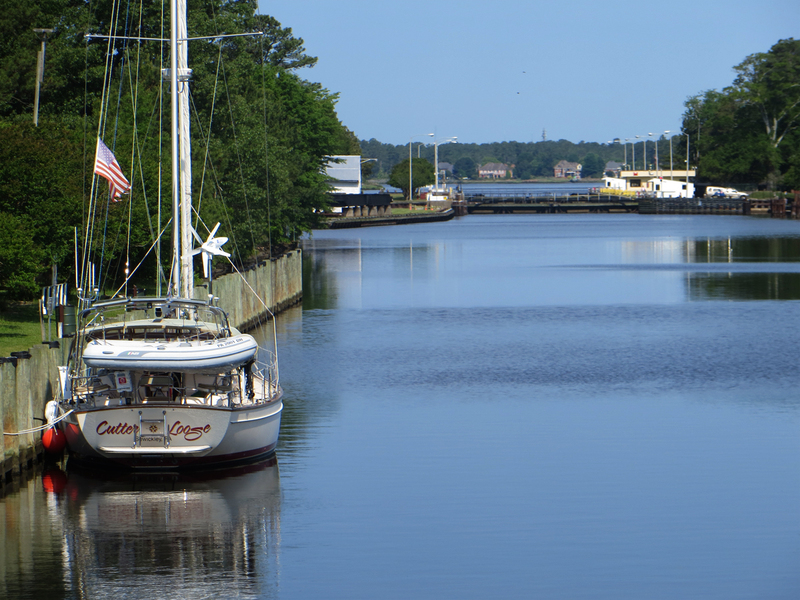 It is tempting to bypass Oriental, skip the appointment with the mechanic at Deaton and follow the ICW north along the Neuse River. But this course of action would surely lead to more anxiety and potentially larger problems. It is best to take the time to sort out the problem before it becomes worse. Intermittent engine problems are difficult to diagnose. Gary, the yard foreman and diesel mechanic at Deaton Yacht Services, feels that some basic maintenance is in order, including a new secondary fuel filter and an on-the-water turbocharger wash. This latter procedure involves injecting cleaning fluid into the turbocharger and testing the turbo “boost” (i.e., pressure) while the engine is running at full throttle. The engine noise and vibration are unsettling, but the process seems to be effective in removing the accumulation of carbon soot from the turbocharger. During our stay at Deaton, we make use of the free loaner vehicle to drive the short distance into Oriental with friends Sara and Ken aboard IP 40, TinTean. 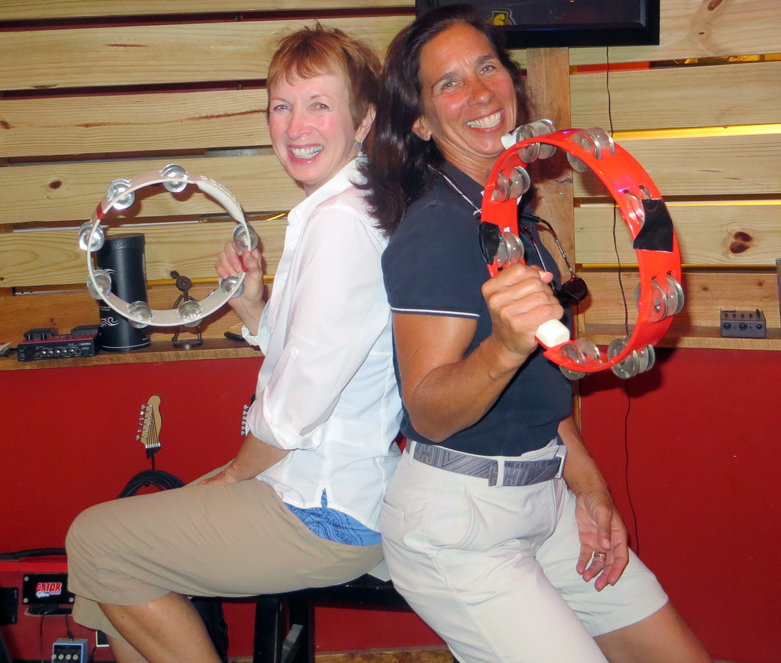 We first met these folks a few weeks ago at Leeward Yacht Club in Green Turtle Cay while waiting for Tropical Storm Ana to pass. They were quite the advance team at Leeward Yacht Club. First, Ken guided us through the tricky entrance channel in his dinghy. As we approached the marina, Sara secured our dock lines. Like Cutter Loose, Tin Tean is here at Deaton for repairs. Since misery loves company, we make the best of our situation by patronizing the bars and restaurants in downtown Oriental during our visit. By Wednesday, 5/20, the engine maintenance is complete and Cutter Loose is discharged from sick bay at Deaton Yacht Services. Anxious to be underway again, our course takes us northeast along the Neuse River, pounding into 15-knot head winds and 2 to 3 foot wind-driven waves. Our private anchorage tonight is in remote Bonner Bay, which provides a comfortable respite from the pounding and a welcome lee from the persistent easterly winds. On Thursday, 5/21, the weather forecast calls for afternoon showers and thunderstorms in advance of an approaching cold front. The anchor is up at 7:45 AM in Bonner Bay in an effort to make northerly progress before the weather deteriorates later in the day. Already the sky is thick with dark clouds as our course along the ICW takes us past the commercial seafood docks at Hobucken Cut. A stiff breeze from the southeast is kicking up nasty whitecaps as we cross the Pamlico River this morning. 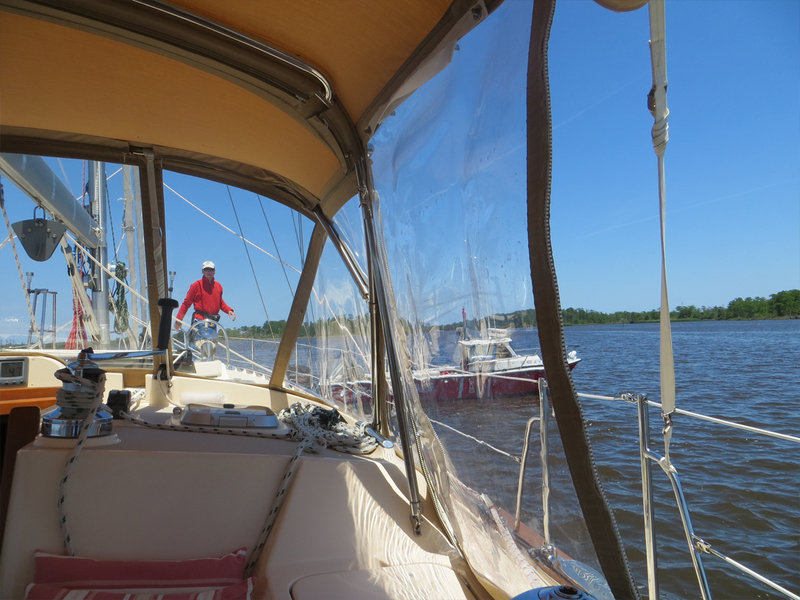 Making the wide turn into the Pungo River moves the wind astern, smoothing out the ride. With Belhaven astern by noon, today’s journey has reached a critical juncture. 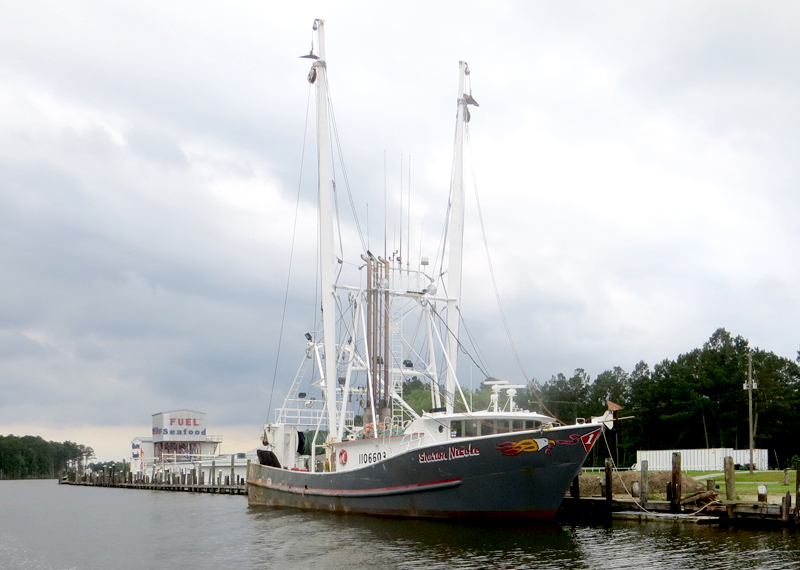 Shall we call it quits at 1 PM and overnight in the protection of Pungo Creek? Or should we enter the narrow confines of the 25-mile dredged Pungo – Alligator Canal with the hope that the forecasted stormy weather will hold off until we complete our transit of the Canal? Since the day is still young, the decision is reached to press on. The gamble pays off. 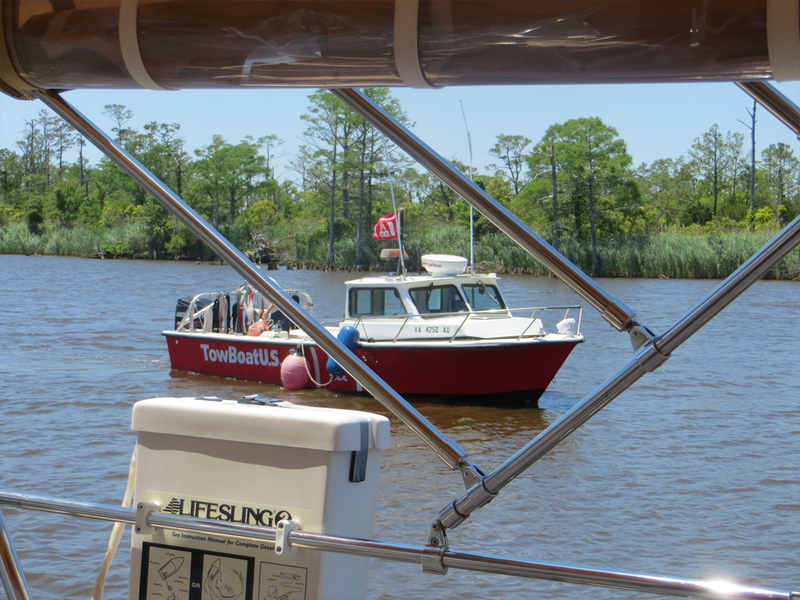 Under darkening skies and distant thunder, the anchor is down near Deep Point in the Alligator River at 4:20 PM. The water here is the color of Guinness Stout. The anchor is set securely in thick, black mud, perfect for riding out a blow. Now comfortably tucked into our secluded anchorage, it is time for a check on the weather. At 4:45 PM, the National Weather Service issues a tornado warning and a severe thunderstorm warning for a four- county area that includes Belhaven, NC and the Alligator River Basin. Yikes! We are anchored precisely in the center of the NWS warning box! Right on schedule, a deluge of heavy rain begins at 5 PM. Shortly thereafter, the wind strengthens and shifts to the northwest with gusts to 25 knots. The wind shift signals that the cold front is now passing directly overhead. The anchorage is pelted with sustained, 20-knot, northerly winds well past midnight and into the early morning hours. Cutter Loose remains secure throughout the night, rotating 360 degrees around her anchor while riding alternatively to wind and current. Dawn on Friday, 5/22 ushers in a gorgeous blue sky with abundant sunshine. The cleansing effect of the cold front is miraculous. Gone are the dark clouds and humidity of yesterday. Cooler, dryer air is in the offing for today. The wind is already subsiding by 10 AM. This is a signal to continue on with the journey. Arriving at the southern entrance to Albemarle Sound at 2 PM, the wind has become light and variable…an amazing weather transformation from yesterday’s fury. This moderation is very much appreciated as the 12-mile stretch of Albemarle Sound that lies between the Alligator River and Virginia has the notorious reputation as a potentially nasty body of water. Today, the Sound is as flat as a pancake. With a total distance run of 45 miles, the anchor is down near Buck Island on the North River at 5 PM. A north wind is blowing on Saturday morning as the anchor is lifted at 8:15 AM. Approaching Coinjock, VA at 10 AM, Cutter Loose falls victim to a series of events that result in a soft grounding in the ICW approaching Coinjock. At a dogleg in the channel, the concentration of crab pots on the green side of the dredged ICW causes us to steer around the pots towards the red side of the channel. The north wind has reduced water depths in the channel, setting Cutter Loose towards the red markers. Without warning, our forward progress comes to a gradual halt…aground in the channel inside red buoy “128”. Fortunately, we renewed our Boat US towing insurance policy while in Charleston. A call to Tow Boat US results in an immediate response from the tow boat operator in Great Bridge, VA, some 30 miles to the north. Apparently, the tow boat operator in Coinjock, VA (2 miles to the north), is unable to help due to “fuel problems”. Three hours later, the tow boat from Great Bridge arrives on the scene, freeing Cutter Loose from the shallows within minutes. 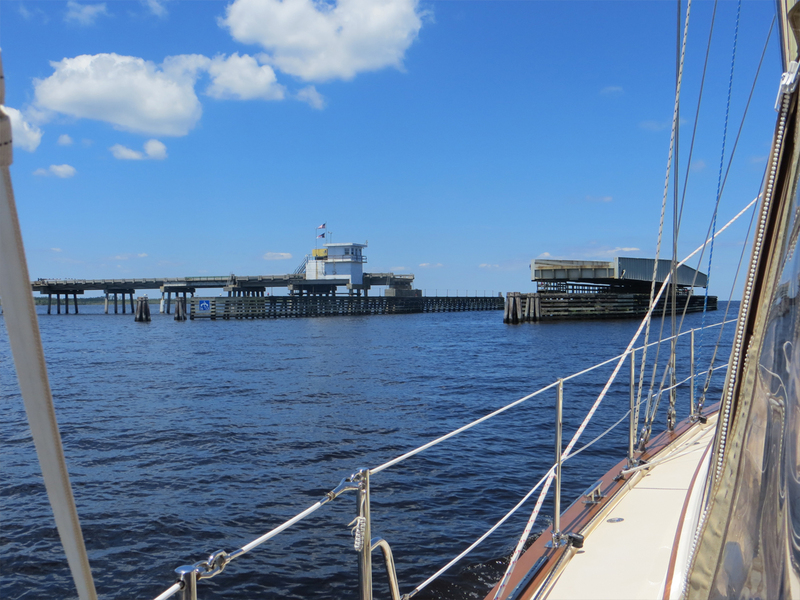 Underway again, it is a rush to make northerly progress through Currituck Sound in a timely manner to make the final 7 PM opening of the bascule bridge at Great Bridge. Once under the bridge, Cutter Loose is tied alongside a wall adjacent to the lock, poised for a rapid getaway in the morning. On Sunday, 5/24, Cutter Loose is the first vessel in line for the 10 AM lock opening at Great Bridge. 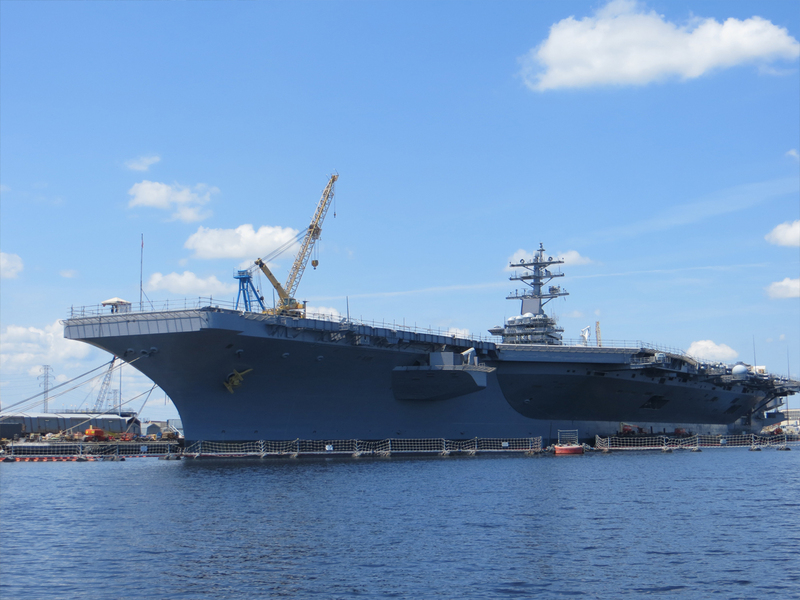 Our course today takes us into the Elizabeth River, past the ubiquitous shipbuilding yards of Hampton Roads and famous Hospital Point, aka mile zero of the Atlantic Intracoastal Waterway. After a short day’s run of just 23 nautical miles, the anchor is down at 2 PM in Hampton, VA in the shadow of Fort Monroe. 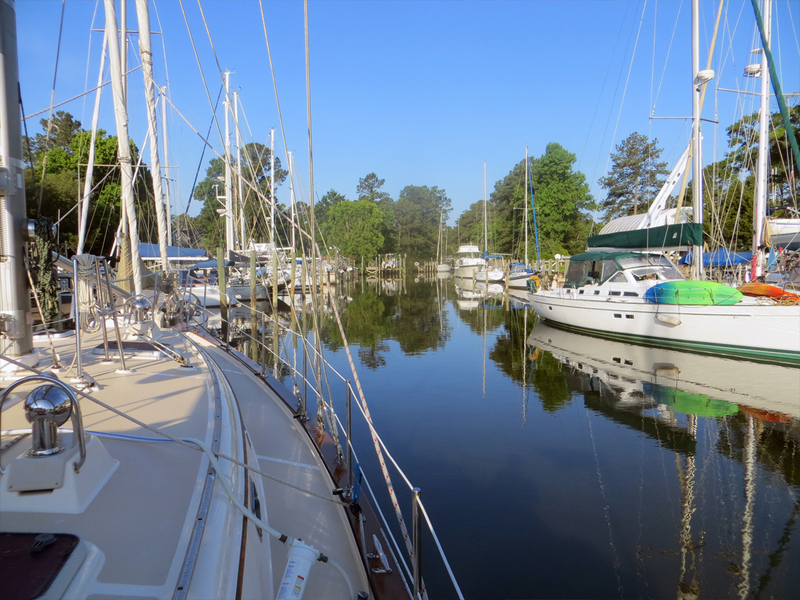 The Phoebus anchorage in Hampton serves as a calm and convenient staging area for the journey north into our home waters of the Chesapeake Bay in the morning. On Monday, 5/25, the anchor is up at 7:25 AM. Today’s leg takes us past Wolf Trap and the Rappahannock River to the Potomac River. Here, we cross from the State of Virginia to the State of Maryland as we approach Point Lookout on the northern shore of the Potomac. One beneficial aspect of travelling at this time of year is the abundant daylight well into the evening hours. 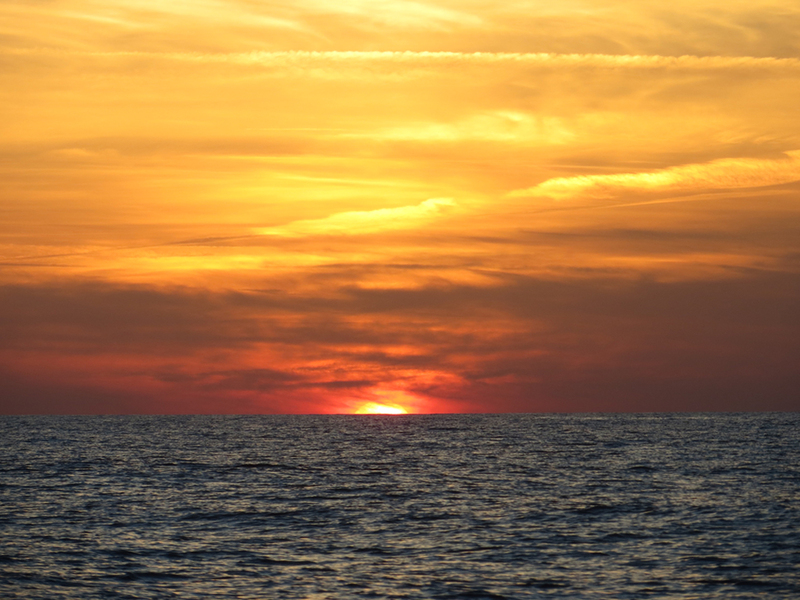 This gives us the option of spending longer days on the water in order to make progress towards our destination. With 83 nautical miles run for the day, the anchor is down at 6:20 PM in Cornfield Harbor. The sole advantage of Cornfield Harbor is its proximity to the Bay. Rather than a protected harbor, it more closely resembles an open roadstead. It is strewn with hundreds of crab pots and exposed to the southeast, south and southwest. This evening, winds from the southeast at 15 knots are kicking up 2 to 3 foot waves at Cornfield Harbor, making for a bouncy night. The Cornfield Harbor anchorage is something to be endured rather than enjoyed. Tuesday, 5/26 is the 173rd and final day of our 2014/2015 winter sailing season. 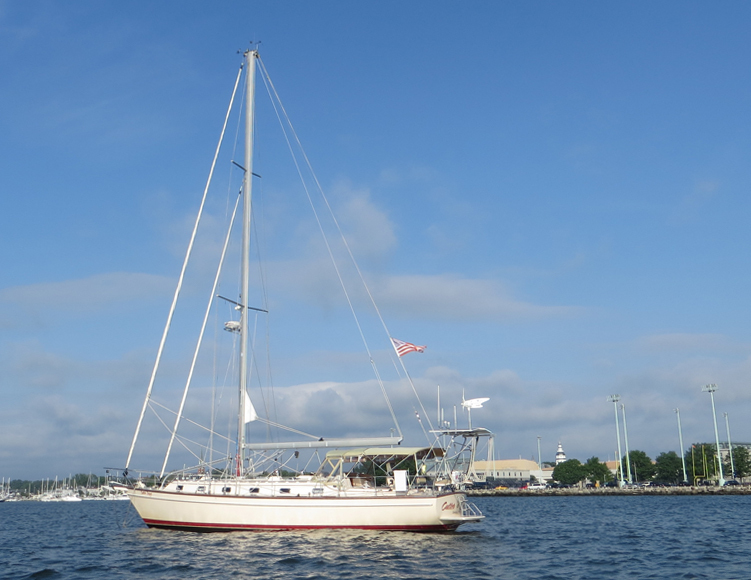 Our destination today is Annapolis, some 66 nautical miles to the north. One beneficial aspect of a bouncy anchorage is the motivation it instills for an early departure in the morning. At 6 AM, the anchor is up in Cornfield Harbor. The southeast wind that was our adversary in Cornfield Harbor is now an able ally in our efforts to reach Annapolis. Today, Cutter Loose is the proverbial race horse, galloping towards the barn as she rides a favorable flood current and is pushed by favorable 15 to 20 knot southerly winds towards her destination. A touch of nostalgia is in the air this morning as we sail past the familiar waters of the Patuxent River, the Choptank River and Eastern Bay. These were some of our favorite destinations during week-long sailing vacations on the Chesapeake Bay. Our vacation experiences were important building blocks. They fueled the desire for exploration and instilled the confidence to reach beyond our home waters to see what lies around the bend. 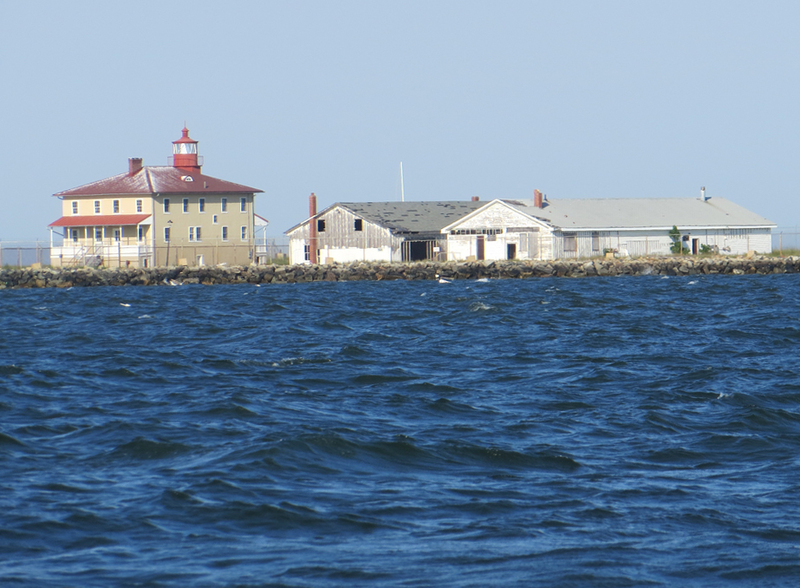 Now, Thomas Point Light is looming large on the horizon. Beyond Thomas Point is the faint outline of anchored cargo ships and the Bay Bridge. These telltale images suggest that Annapolis cannot be far away. 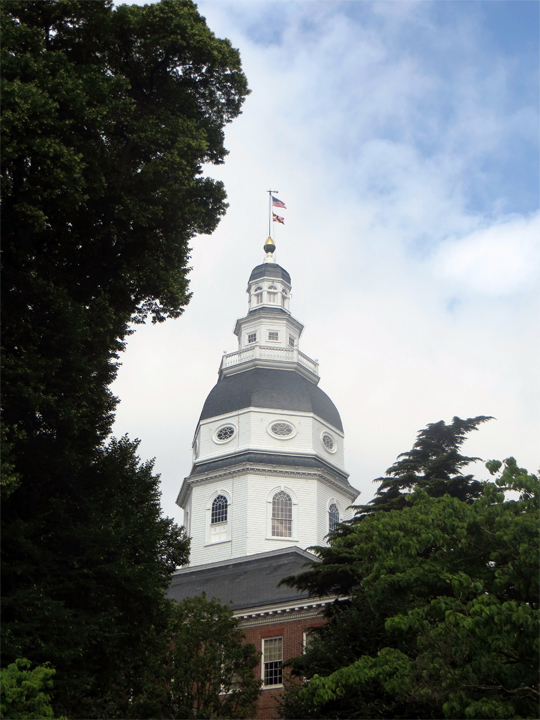 Rounding Tolly Point, the majestic Maryland State House and the solemn green dome of the Naval Academy Chapel come into view. We pause for a moment to contemplate our surroundings and savor our accomplishment. Three years ago, our voyage to the Eastern Caribbean began in this very place. On this day, 7,000 miles later, the circle is now closed. In the past six months alone, we have sailed Cutter Loose from the south coast of Grenada (12 degrees north latitude) to Annapolis, MD (38 degrees north latitude)…a distance of some 3,200 nautical miles. Along the way, we have visited enough islands and accumulated sufficient memories to last a lifetime. At 2:45 PM, the anchor is down in our old stomping grounds near the Academy practice field. Cutter Loose is appropriately alone in the anchorage today. Two smiling sailing partners share high-fives and silently embrace on the foredeck. This voyage has taken us further away and brought us closer together than we ever could have imagined.